Once repeated Count seat in unique location right on the lake and on own small private harbor at Lazise. Simple apartments for a relaxing holiday. With its unique location directly on the shore of Lake Garda, the erstwhile seat Count La Bagatta offers a unique setting. 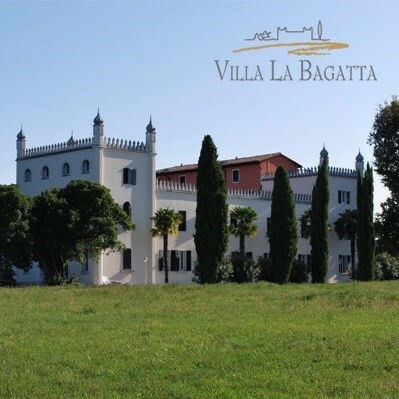 With its unique location right on the lake and the magnificent views of the lake and mountains, the winery Villa La Bagatta offers a unique ambience. Private beach and direct access to the lake form the active contrast to the extensive parkland with mature trees surrounding the majestic vinery. Apartments of different category are perfect for self-catering families with children. An older tennis court, as well as plenty of open area with couches, chairs and barbecue are available for free use of our guests. For water lovers and boat owners: in our small marina are often berths for motor boats available. Call us!